Jason Freeman is stoked when his family relocates to exclusive DeVere Heights, Malibu. The in-crowd at his posh new high school is surprisingly friendly -- soon Jason's hitting all the best parties. He even meets the token hot-but-unattainable girl. Determined to enjoy his almost postcard-perfect new life, Jason tries hard to ignore the many strange things going down in DeVere Heights. But then a girl washes up dead the morning after one off-the-hook party -- and with no explanation but a suspicious-looking bite mark. Now Jason has to admit that what you don't want to know can hurt you. I bought the omnibus editions of Bloodlust & Initiation and Ritual & Legacy at least a year ago, but I don't like to start a series until I have every book. It wasn't until recently that I was able to track down the last book - Simon Pulse didn't rerelease the last two in the new omnibus editions. But I've been chomping at the bit to read this series, so I was excited to finally get started! Bloodlust is the story of Jason Freeman, a fresh transplant from Frasier, Michigan (!!! ), to DeVere Heights, California. Jason quickly gets into the popular crowd, as he moved into the exclusive DeVere Heights gated community. Soon, though, he begins to realize that the crazy parties are hiding something sinister, and that deadly secret comes into the light after he finds one of his classmates washed up with what looks like needle marks in her arm. 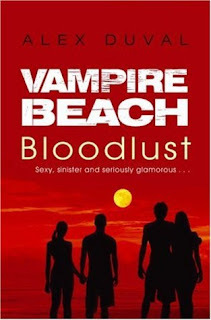 While it's not the greatest vampire book I've read, Bloodlust certainly has all of the hallmarks of a good vampire story and is, if nothing else, a fast and easy read, clocking in at just under 200 pages. The setting and quick pace make this the perfect beach read. I liked it because the male narrator is not a vampire - the female love interest is. Jason was also a very easy character to like. He's not perfect, but he recognizes when he's made a mistake and attempts to rectify it. That's a lot more than I expected from boys when I was in high school! The friend, Adam, is a little strange, always carrying around is videocamera, but I grew to like him too over the course of the story. I definitely plan on picking up the second book soon. Alex Duval is a pseudonym for Laura Burns and Melinda Metz, co-authors of the Crave series.